1 Exeter is located on the west side of Exeter, between Beacon and Marlborough, with 299 Beacon to the north and 3 Exeter to the south. 1 Exeter was built ca. 1870 for building contractor George Wheatland. Jr., for speculative sale, one of four contiguous houses (1-3-5 Exeter and 299 Beacon) which form a single unit between Beacon Street and Public Alley 417. George Wheatland, Jr., purchased the land for 1-3-5 Exeter and 299 Beacon on February 2, 1870, from the Commonwealth of Massachusetts. The original parcel had an 80 foot frontage on Beacon. He built the four houses on the eastern 61 feet of the parcel, with 299 Beacon about 40 feet wide and 1-3-5 Exeter about 40 feet deep, leaving an open yard area of about 21 feet to the west. When he sold the houses, he included a permanent easement across the rear of 1-3-5 Exeter to provide for passage and drainage to the alley. Click here for an index to the deeds for 1 Exeter. On December 12, 1870, 1 Exeter was purchased from George Wheatland, Jr., by George Washington Simmons, a retail clothing merchant. He and his wife, Frances A. (Gay) Simmons, lived at 6 Walnut. In March of 1871, he also purchased 299 Beacon from George Wheatland. They leased it to others until the early 1880s, when it became their home. 1 Exeter became the home of the Simmons’s son-in-law and daughter, Edward Henshaw and Frances A. (Simmons) Henshaw, who married in February of 1871. Edward Henshaw was a wholesale dealer in leather findings. Edward and Frances Henshaw continued to live at 1 Exeter in February of 1874, when their daughter, Bertha, was born, but by 1875, had moved to 13 Gloucester. 1 Exeter continued to be owned by George W. Simmons. By 1875, 1 Exeter was the home of Joseph Howe Wales and his wife, Isabelle (Webb) Wales. They previously had lived at 337 Marlborough. Joseph Wales was a ship owner and East India merchant in his father’s firm, and then an insurance broker. They continued to live there in 1877, but had moved to New York by 1878. By the 1878-1879 winter season, 1 Exeter was the home of wholesale flour and grain merchant Wesley Perkins Balch and his wife, Almira Patterson (Smith) Balch. They previously had lived at 34 Chestnut. They continued to live at 1 Exeter during the 1882-1883 season, but moved thereafter to Milton. 1 Exeter was not listed in the 1884 and 1885 Blue Books. In May and June of 1885, 1 Exeter was purchased by George Frost through several transactions with the heirs of George W. Simmons. George Frost was a manufacturer of ladies’ and men’s clothing. He and his wife, Almira (Hutchins) Frost, lived in West Newton. 1 Exeter became the home of the Frosts’ son-in-law and daughter, Edward A. Adams and Adeline Freeman (Frost) Adams. They previously had lived at 8 Joy. He was a steamship agent and commission merchant. They continued to live at 1 Exeter during the 1886-1887 season, but moved thereafter to the Hotel Victoria at 273 Dartmouth. On September 2, 1887, 1 Exeter was purchased from George Frost by Mary Washburn (Baker) Strong, the wife of Dr. Charles Pratt Strong, a physician and surgeon. He also maintained his medical office at the house. They previously had lived (and he had maintained his office) at 37 Charles. 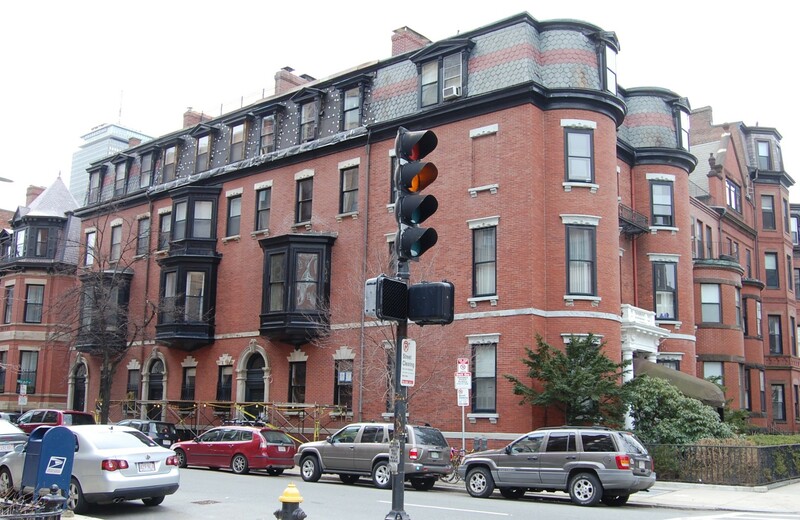 The Strongs continued to live at 1 Exeter during the 1891-1892 winter season, but moved thereafter to 258 Beacon, where they were living at the time of his death in March of 1893. Mary Strong continued to own 1 Exeter and lease it to others. The house was not listed in the 1893 Blue Book. By the 1893-1894 winter season, 1 Exeter was the home and medical offices of Dr. George Haven and Dr. Algernon Sidney Coolidge, Jr., physicians. George Haven previously had lived at The Pinckney at 26A Pinckney. Algernon Coolidge previously had lived at 81 Marlborough with his parents, Dr. Algernon Sidney Coolidge and Mary (Lowell) Coolidge. Algernon Coolidge married in December of 1896 to Amy Peabody Lothrop and, soon thereafter, they moved to 3 Exeter while awaiting completion of the house they were having built at 487 Commonwealth. While living at 3 Exeter, he continued to maintain his medical offices at 1 Exeter. George Haven continued to live and maintain his office at 1 Exeter in 1898. 1 Exeter was not listed in the 1899-1902 Blue Books, nor was it enumerated in the 1900 US Census. On October 3, 1902, 1 Exeter was purchased from Mary Strong by Mary H. (Taylor) Jaquith, the wife of attorney Harry James Jaquith. They previously had lived in Wellesley. Harry Jaquith’s father, Benjamin Franklin Jaquith, was living with them in June of 1910, at the time of the 1910 US Census. He died later that year. Harry and Mary Jaquith continued to live at 1 Exeter during the 1913-1914 winter season, but moved to Brookline thereafter. On June 30, 1914, 1 Exeter was purchased from Mary Jaquith by real estate dealer William J, Stober. He and his wife, Josephine (Flavin) Stober, lived at 1 Exeter during the 1914-1915 winter season. Their primary residence was in Roslindale. On January 23, 1915, William Stober recorded a deed (dated July 1, 1914) transferring he property to Francis R. Hart, trustee for the benefit of Beatrice Wilhelmine (Helleberg) Bowie, the wife of Edward Mandell Bowie. They were separated and she probably was abroad with their young daughter, Beatrice Marie Bowie, probably in Jamaica. Francis Hart was Vice-Chairman of the Old Colony Trust Company. 1 Exeter was not listed in the 1916 and 1917 Blue Books. By the 1917-1918 winter season, 1 Exeter was the home of Belle (Pritz) Herman, the widow of William Herman, who had been a dry goods merchant in Nashville. Their two sons, William Jacob Herman and Edward Pritz Herman, lived with her. They both were graduate students at Harvard. William Herman would become one of the first psychiatrists at Massachusetts General Hospital, and Edward Herman would become an investment banker. Mrs. Herman and her sons continued to live at 1 Exeter during the 1920-1921 winter season, but moved soon thereafter. During the 1921-1922 winter season, Beatrice Bowie and her daughter made 1 Exeter their home. They also maintained homes in Sharon and in Jamaica. 1 Exeter was not listed in the 1923-1925 Blue Books. By 1924, it was the home of Gertrude May (Hood) Park, the widow of John Francis Park, and their daughter, Annabel Park. 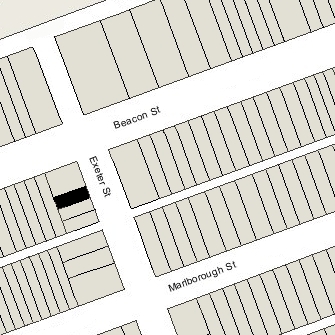 In 1923, they had lived in an apartment at 330 Dartmouth and prior to that at 10 Gloucester. They continued to live at 1 Exeter in 1925, but had moved to 31 Gloucester by 1926. During the 1925-1926 winter season, Mrs. Bowie and her daughter were living at 1 Exeter once again. Beatrice Marie Bowie left for Europe soon thereafter, where she studied in Paris and then at Oxford. Mrs. Bowie remained at 1 Exeter during the 1926-1927 season, but then moved, probably either to her home in Jamaica or in Sharon. By the 1927-1928 winter season, 1 Exeter was the home of US Army Colonel Sherwood Alfred Cheney and his wife Charlotte (Hopkins) Cheney. The house was not listed in the 1929 Blue Book. 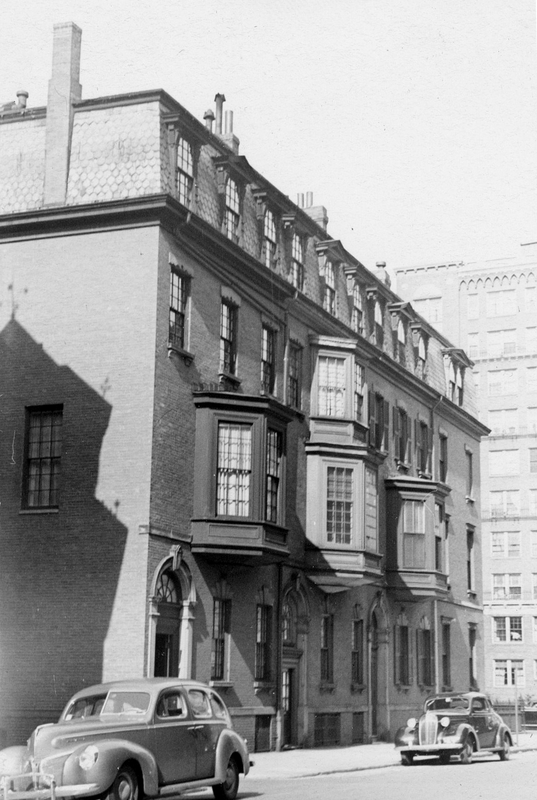 During the 1929-1930 winter season, it was once again the Boston home of Mrs. Bowie and her daughter. During the 1930-1931 winter season, 1 Exeter was the home of William Cabot Bramhall, a salesman, and his wife, Christine (Dexter) Bramhall. They also maintained a home in Weston. They continued to live at 1 Exeter during the 1931-1932 season, but moved thereafter to 10 Fairfield. Beatrice Marie Bowie married in 1930 to Horace Felix DeCourcy Pereira, whom she had met in a fencing club at Oxford. They settled in Boston where he became a banker. They lived first at 86 Mt. Vernon, but had moved to 1 Exeter by the 1932-1933 winter season. They continued to live there in 1934, but had moved to Dover by 1935. 1 Exeter was not listed in the 1935 Blue Book. By the 1935-1936 winter season, it was the home of attorney Charles Harold Baldwin and his wife, Marion Ann (Landry) Baldwin. They previously had lived in an apartment at 259 Beacon. They initially leased 1 Exeter from Beatrice Bowie’s trust; on May 1, 1937, Marion Baldwin purchased the house from the trust. Their daughter, Elaine Marion Baldwin, lived with them. She married in 1936 to Elmer Page Madsen following his graduation from Harvard in June of that year. They lived with her parents at 1 Exeter during the 1936-1937 winter season but divorced soon thereafter. Elaine (Baldwin) Madsen continued to live with her parents and remarried in July of 1938 to Otto August Ritzman, Jr., a salesman. After their marriage, they lived with her parents until about 1941, when they moved to Medford and then, by 1943, to an apartment at 195 Marlborough. C. Harold Baldwin died in October of 1943 and Marion Baldwin moved soon thereafter to live with her son-in-law and daughter at 195 Marlborough. On December 4, 1943, 1 Exeter was purchased from Marion Baldwin by Verna Mae (Klink) Gordon, the wife of William H. Gordon. They appear to have separated at about this time. They previously had lived in an apartment at 342 Marlborough. On December 1, 1944, 1 Exeter was acquired from the Gordons by Kenneth Hugh Perkins and his wife, Helen B. (Allen) Perkins. They previously had lived in an apartment at 458 Beacon. He was president and treasurer of the Commercial Trading Company, clothing manufacturers and wholesale dealers in men’s clothing. He died in January of 1949 while they were traveling in Bermuda and Helen Perkins moved from 1 Exeter soon thereafter. In 1949, 1 Exeter was the home of Louis Mortimer Pratt and his wife, Elizabeth (Stuart) Pratt. They previously had lived in Brookline. He was president of Davenport Peters Company, wholesale lumber merchants. In 1950 and 1951, 1 Exeter was the home of Mary N. Gilbert. She previously had lived in California. On August 8, 1951, 1 Exeter was purchased from Helen Perkins by attorney Henry H. Davis and his wife, Virginia Mildred (Nason) Lyons Davis. They previously had lived at 415 Beacon. They subsequently moved to an apartment at 275 Beacon. On October 1, 1952, 1 Exeter was purchased from the Perkinses by Mrs. Helen A. (Leonard) Westcott, the former wife of Arthur Goodwin Westcott, who operated it as a lodging house. She was a nurse and previously had lived in Brookline. In March of 1956, she purchased 227 Marlborough, which she also operated as a lodging house. On March 7, 1957, she transferred both properties to herself as trustee of the Westcott Trust. She continued to live at 1 Exeter until about 1958. On June 3, 1958, 1 Exeter was purchased from Helen Westcott by Frederick J. Dubrava, Jr., an accountant. He purchased 227 Marlborough from her on the same day and made it his home. The property changed hands, and on July 10, 1961, was acquired by Pollyann Elizabeth (Tillinghast) Frost, the former wife of Burton Willis Frost, Jr., as trustee of the Pollyann Realty Trust. She operated it as a lodging house. She previously had lived in an apartment at 29 Fairfield. She also owned and operated lodging houses at 13 Marlborough, 211 Beacon, and 256 Commonwealth, all of which she sold in early 1962. Pollyann Frost continued to live at 1 Exeter until about 1964. The property changed hands, and on March 29, 1979, it was purchased by the Werner Real Estate Corporation. It remained a lodging house. In June of 1984, Werner Real Estate filed for permission to remodel the interior and establish the legal occupancy of the property as a single-family dwelling (the Building Department had no record of the legal occupancy). It subsequently abandoned the application. On June 29, 1984, 1 Exeter was purchased by public relations consultant and former Lt. Governor Thomas Phillip O’Neill, III, and his wife, Jacqueline Anne (DeMartino) O’Neill. In July of 1984, they filed for (and subsequently received) permission to remodel the interior and establish the legal occupancy as a single-family dwelling. On April 22, 1986, the O’Neills transferred the property into Jacqueline O’Neill’s name. In May of 1999, Jacqueline O’Neill filed for (and subsequently received) permission to add “a projecting oriel bay” at the rear. In March of 2000, she filed for (and subsequently received) permission to change the legal occupancy from a single-family dwelling to a two-family dwelling. On January 26, 2012, 1 Exeter was purchased from Jacqueline O’Neill by Stephen P. DeFalco and his wife, Rosemarie F. DeFalco. They subsequently converted the property back into a single-family dwelling. 1 Exeter remained a single-family dwelling in 2016.